Dimensions H x W x D 8" x 4" x 9.5"
The Sampan FTL utilizes a miniscule cabinet that manages to provide a folded transmission line to help with the lower frequencies. Also featured is a cast aluminum frame, neodymium magnet and an under hung motor. The speakers are also magnetically shielded, if you, for some reason insist on placing speakers within inches of a video monitor. I have to give Role Audio my highest regards for their efforts towards making their products and operations as environmentally friendly as possible. I encourage you to read this page on their website on their environmentally friendly efforts, even if it is a bit wordy and redundant. - MDFs that are free of urea and formaldehyde. - Assembled with non-toxic glues and lead free solder. - Painted with water based paints. - Grills made with formaldehyde-free MDF, non-toxic glues, and nylon fabrics. - Packaged with biodegradable honeycomb paper product and/or foam that does not cause ozone depletion. - Shipped in cartons made from recycled and/or non-toxic materials. I hope more manufacturers follow their lead and realize it is possible to produce excellent product, which is minimally burdensome on the environment and doesn't cost very much. Not all has to be sacrificed in the name of personal consumption. 200 hours of burn in...you've got to be kidding me. Seriously, that was the manufacturer's recommendation. But what really got my goat, was the suggestion that the speakers should be played for an hour before critical listening. Sorry, homey don't play dat! That much prep for any kind of pleasure is self defeating, and I refuse to comply. I still complied with the initial burn-in suggested. As I listened to the Sampans for many weeks while they were breaking in I was shocked to experience a very full sound, excellent detail and a deep and wide sound stage (well, maybe the last was more expected than a surprise). But I am definitely of the mind that you cannot evaluate without some attempt at direct comparisons, I held judgment till that time. For comparisons, I used the my longtime companions the Dynaudio Contour 1.3 MkII, not exactly a fair comparison since the Dynaudios were almost twice the price when last sold. And then, as if to compensate I also compared to the Triangle Electroacoustique Titus 202, that sold for less than half of what the Sampans sell for. First, I used test tones to assess the bass extension. Compared to Dynaudios there was a considerable difference below 63hz. The Sampans only put out a semblance of the lower bass notes through their ports, and below 40hz the only sound was that of the surrounds exhausting themselves in vain. Not that I would have expected much more from speakers this size, but when the manufacturer claims -4db at 40hz they better had deliver more than what I heard. And if you think that was an unfair comparison, it was. But the results were similar, though at a smaller differential, when compared with the same tones to my other longtime companion - the Triangle Titus 202. There was no comparison to the Dynaudios whatsoever; the Roles produced only a shadow of the double bass. The Dynaudios also had better details on male vocals, however the Sampans seemed to handle dynamics with more ease and naturalness at low to moderate volume levels. The Dynaudios were a bit better in treble detail, but not by an easily noticeable margin. That in of itself is quite an achievement, given that we are talking about the famed Dynaudio Esotec tweeters. When compared to the Triangles, the Sampans were not as extended in either extreme and that made quite a difference in the overall presentation. The shimmer of the cymbals was missing the air and texture that I could hear with the Triangles, but that is what you would expect from a single, small driver speaker. The overall sound from the Sampans sounded restricted and boxed in, relatively speaking. Also, the kick drum sounded quite truncated on the Sampans, even when compared to the bass shy Triangles - again, there is only so much a 3.5" driver can do. But when a decade old speaker for half the money sounds that much better, the Sampans have completely failed to provide a value proposition. Compared to the Dynaudios, the Sampans could not deliver the full heft of the instrument. Also the sense of space and air was noticeably lesser with the Sampans. Again, the Role was missing something in the extremes. 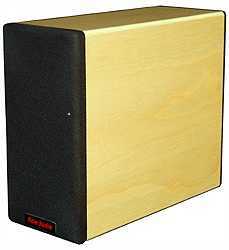 In my opinion, while the midrange is fairly important, it is not important enough that serious shortfalls in the bass and treble can be overlooked. On the other hand, while the Triangles do have a tendency to get sharp in the treble at high volumes, you will never have that problem with the Sampans and don't have to worry about fatigue setting in. A very revealing recording, as it has very complex passages with lots of dynamics. The Sampans became a bit strident at moderately high volumes during these challenging passages. 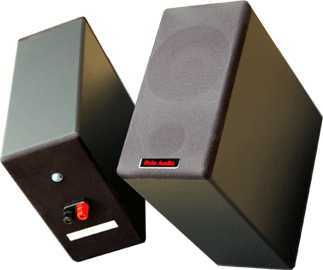 While the power handling of these speakers is not specified (and why not? ), it is evident by the 3.5" driver and confirmed by the performance in this test that these speakers are not meant for heavy duty tasks. I guess, we now know why the specs are not published. Relatively speaking, the Sampans reproduced the female vocals with some restraint and boxed in sound, relative to the Triangles that sounded a lot more natural and unencumbered. Quite an engineering feat - I would never have predicted the scale and quality of sound from the sheer size of these speakers. And, double kudos for the environmentally friendly materials - Role Audio has broken paradigms in this aspect and now it is for other manufacturers to take heed. But when it comes to value and performance, they sadly lagged behind both comparative samples. But in situations where you are very pressed for space, these would be worth checking out.